I showed up over an hour late to a doctor's appointment yesterday because I fucked up my Google Calendar alert — it pinged while I was working from home in a Pippin The Musical T-shirt with coconut oil on my split ends. But the most frustrating aspect of the screw-up was that I couldn't chalk it up to the planet Mercury, which didn't go into retrograde until this morning. I'm not big on astrology, because I think I'm a special snowflake and don't see how the zillion other Virgos out there AND I could all really "get good news about your career on the first of the month!" or whatever. But I'm also super Type A (so Virgo, I know) and hate accidentally flaking on people or projects. Enter: Mercury in Retrograde, responsible for "communication breakdowns, delays, and frustration" and thus the perfect excuse for spacing out. Don't feel bad that your phone died/that email saved as a draft instead of sent/you double-booked your Friday! It's the fault of the smallest and closest planet to the sun! Here's a quick primer so you can embrace this special occasion, too. What is Mercury in Retrograde? Don't stress, doomsayers: Mercury is not really going backwards. According to our brother site i09, the name was conceived back when people still thought Earth was the center of the solar system; no planet actually moves backwards while orbiting around the sun. But, a few times a year, Mercury appears to be moving backwards in the sky for approximately three weeks. But what does it mean about meeee? What happens when Mercury retrogrades? You miss appointments, your computer equipment crashes, checks get lost, you find the car you just purchased during Mercury retrograde is a lemon. (Or, you hate your haircut, the lamp you bought shorts out, your sister hates her birthday gift.) There will be countless delays, cancellations and postponements—but know these will benefit you in the long run. Don't fight them, although your frustration level and feeling of restlessness will be hard to cope with at times. Pay close attention to what you say and communicate in general, particularly around the days of Mercury's stations (June 26th and July 20th), as well as around retrograde Mercury's conjunction to the Sun on July 9th. If you are itching to argue with someone, especially, or if you are planning on "signing on the dotted line", try to hold off. It is likely that you will have a change of mind once the station passes, and you can do some damage in the meantime. When a planet stations, its energies are very strong in our lives. When Mercury stations, communications have more impact, so that negative ones could have long-term implications at this time. However, if you are very clear within yourself and about what you are communicating, this can be a positive thing. This period is best used for re-organizing and reflecting. We look at the world a little differently—through different filters—and can come up with some very important inner revelations. It may be difficult to communicate them under this influence, but not everything needs to be rationalized. Mercury retrograde periods can be times of heightened inner awareness, when meditation, benefiting from keeping a journal, reworking old plans, and reviewing past work are favored. Minor breaks in the mechanical aspects of communication can actually re-connect us to other means of communication, such as when there is an unexpected power outage and we're forced off the computer and television, finding different and often satisfying ways to entertain ourselves. Fun perk: "When Mercury is retrograde in the natal chart itself, the thinking processes are generally more acute, and the sense of humor rather quirky." I knew my writing was particularly witty and hilarious today. How can I tell when it is? 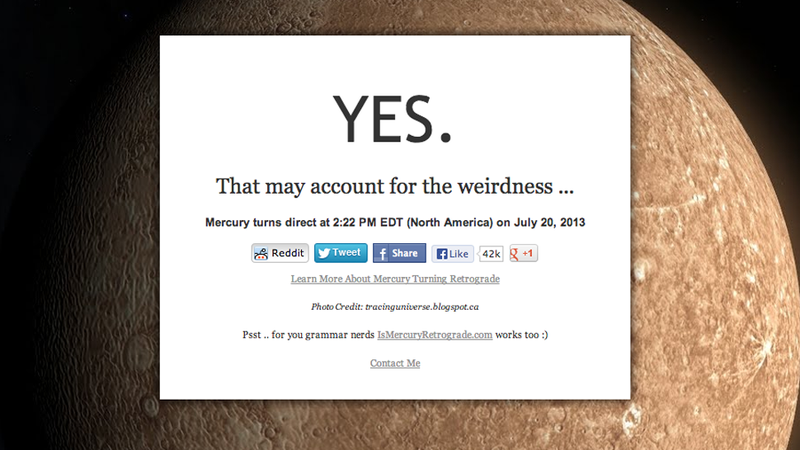 By visiting this super helpful website: Is Mercury in Retrograde? What can I use it as an excuse for? Tardiness, late rent checks, unread emails, grammatical errors, general insecurity and malaise...the possibilities are endless! Add your own below and let's all collectively sigh together.